New Zealand’s favourite twin sisters, Lynda and Jools Topp, are bringing their wildly successful kids books and songs to the stage in a special live family show for one performance only. These beloved entertainers will deliver a memorable classic Kiwiana family show with a farmyard theme. 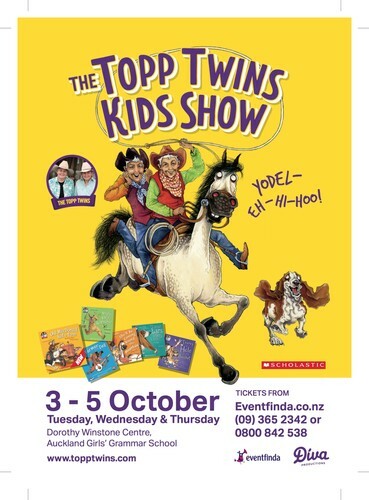 The show is based on The Topp Twins Scholastic range of books that have been best sellers since first being published in 2011. Audience participation is a guarantee and the show will include all their kids songs ‘There's A Hole In My Bucket’, ‘Do Your Ears Hang Low’, ‘She'll Be Coming Round The Mountain’, ‘Farmer In The Dell, ‘Dingle Dangle Scarecrow’ and ‘Old MacDonald Had A Farm’. Armed with guitar, mouth-harp and spoons, expect the unexpected and some of the finest yodelling you’ll hear anywhere. The Topps will delight all ages with a memorable hour of fun and fine singing.